God of War is the latest historical epic from director Gordon Chan who also co-directed The Four and Painted Skin. 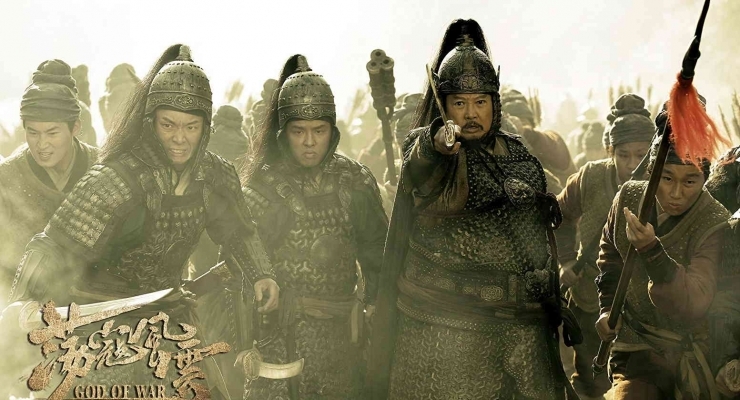 Starring Zhao Wenzhuo (True Legend), this film takes a more serious tone than some of Chan’s previous works and follows the epic battles during the mid 16th century between the Chinese forces and Japanese pirates constantly raiding their shores. Zhao plays the brilliant General Qi Jiguang who must join forces with General Yu Dayou (Hung Sammo Kam-Bo) to oust Japanese samurai pirates and their ronin (masterless samurai) forces that have ravaging the villages along the Chinese coast and eventually takeover Cengang in Zhejiang. When the pirates, under the leadership of Commander Kumasawa (Kurata Yasuaki) and Lord Yamagawa (Koide Keisuke) escape, General Qi devises a plan to route them once and for all, while General Yu sits imprisoned wrongfully accused of conspiring with the Japanese. God of War as been compared to John Woo’s epic Red Cliff, and while there are some similarities, it never reaches the level of cleverness or the scale of Woo’s epic. Chan’s film fails to be quite as intelligent in capturing the wit of strategy involved in the warfare, instead only pushing on its viewers the unlikely scenarios of brilliant maneuvers that seem to be pulled right out of the ether. God of War also falls down on character structure. This being a Chinese production, the Japanese characters are woefully underdeveloped and are portrayed as one-dimensional, caricatures of what samurai and ronin may have been – that is prideful to a fault for the samurai and nothing beyond drunken rapists for the ronin. They are not the only ones that suffer, however. The female characters in God of War are practically non-existent. They are either peripheral Chinese women being raped by the Japanese, acting as servants to the Japanese or Chinese soldiers or, in the case of Regina Wan, who plays Lady Qi, wife of General Qi, shrewish without reason. The film is best when the exposition is set aside and the magnificent battles are at hand. Chan’s direction is superb in these historical battle sequences and the choreography of the martial arts is both bold and riveting. God of War is also an awesomely shot and designed film. Visually, this is a stunning masterpiece of Asian cinema, one of the best I have seen despite a few flaws with some cheesy CGI effects that seem to be par for the course in these Chinese historical epics. This one seems to have the fewest of those as well. 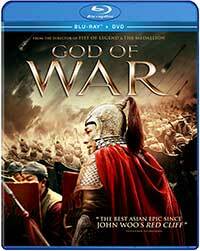 God of War arrives on Blu-ray on a beautiful AVC 108op encodement on Blu-ray from Well Go USA. This is a film that is crying out for a release on 4K Ultra HD with some form of HDR, but despite being in HD, it has beautiful color and contrast. There are scenes with fires that really ‘pop’ nicely against inky black backgrounds. The lavish costumes and detailed historical sets all standout and the battle sequences are crisp with every bit of blood and grit displaying without any noise or motion artifacts. A marvelous bi-lingual Mandarin and Japanese DTS:X (listed only as Mandarin on the packaging and disc menu) mix is offered up on Blu-ray for God of War. It’s one of the best immersive mixes Well Go has included to date. It’s well balanced, dynamic, has deep low frequency extension, clean dialogue and utilizes those “X” channels for an abundance of atmospherics as well as some discrete sounds. During the multitude of fight sequences you are really placed in the middle of the action. Only a ‘Making Of’ and the theatrical trailer are included along with a standard DVD in what are slim pickings for the special features and extras on this set. A lavish epic that falls down when it comes to maintaining a sensible story arc or building a riveting battle of wits, God of War is nonetheless an awesome piece of action, atrial arts, and warfare that is visually and aurally breathtaking. The Blu-ray from Well Go USA is immensely satisfying despite being a bare-bones release. God of War is out on Blu-ray + DVD Combo Pack & DVD from Well Go USA October 17, 2017. A mid-16th century Chinese general (Zhao Wenzhuo) must outwit the overwhelming forces of Japanese samurai and ronin pirates ravaging the Chinese coastline in Zhejiang in this lavish, gorgeously filmed historical epic from director Gordon Chan (The Four) that is light on exposition, but heavy on the action.